"Help! My W-2 is wrong! What should I do?" It happens more often than you might think. You receive your W-2 and the wages reported on there seem wrong. You double-check against your own records and realize that the information is indeed incorrect. You have to get the situation fixed, and you have to do it relatively quickly because the clock is ticking toward the tax-filing deadline. But that might be easier said than done. Maybe your employer has gone out of business or is otherwise having financial difficulties, so he doesn't have an office staff available to correct the problem. Maybe he's even filed for bankruptcy. You can't even get copies of your pay stubs to prove the inaccuracy. You might have a moral dilemma on your hands as well. Maybe the W-2 reports less wages than what you know you earned. If you just shrug and file using that information—after all, it's what you were given, and it's what was reported to the Internal Revenue Service—you'll get more of a refund. What to do? You have a few options, and the rules and guidelines are pretty black-and-white. Is There Really a Mistake? First, make sure the information on your W-2 is really in error. Sometimes the amounts shown are slightly different from the amounts reported on your final pay stub of the year. 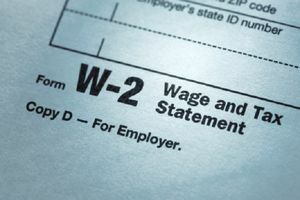 The W-2 might include adjustments in taxable income or tax-free benefits. The easy solution is to check with your employer or human resources department for an explanation. If this doesn't seem to be the problem or your employer can't or won't shed light on the situation, the error might be more serious. It's possible that your employer is trying to hide W-2 income from the IRS, particularly if he's been having financial difficulties. Why? Because he must pay half your Social Security and Medicare taxes based on your earnings. The less you earn, the less your employer pays in these payroll taxes, so if business is bad and he hasn't been paying these taxes in full, he might have some incentive to fudge the numbers a bit. It isn't a good thing, not at all. In fact, the IRS would love to hear about it. Contact the IRS and file a complaint if your W-2 is obviously and significantly wrong and you suspect dishonesty on the part of your employer. The IRS will investigate the matter directly with him. You can call the IRS toll-free at 1-800-829-1040. You can also report an incorrect W-2 by following instructions made available on the IRS website. Then you can file your tax return reporting what you think is the correct amount of wages and withholding using Form 4852, Substitute for Form W-2. You will have to reference your pay stubs if you use this form. The IRS might take longer to process your tax return because it must verify the amounts on Form 4852 and it may contact you with any questions. There may be another way to solve the problem if your employer has gone bankrupt. According to the IRS, when a former employer has gone bankrupt, it is sometimes possible for the employee to follow up directly with the bankruptcy court. The bankruptcy trustee may be able to provide a corrected W-2 to the employee rather than the employee having to use a substitute W-2 (Form 4852). If that isn't possible, then filing Form 4852 is the best option. So you could contact the bankruptcy court in your area if you find yourself in this situation. Ask how you can contact the trustee who is overseeing your previous employer's bankruptcy case, then reach out to him or her and explain the situation. You might want to find an accountant to help you if your W-2 is wrong. Look for an enrolled agent, a certified public accountant, or a tax attorney because these are the only professionals who can talk to the IRS on your behalf without you being physically present. Preparing an accurate tax return can be tough, and the IRS is always willing to help you investigate matters like this that can complicate the process even more. The IRS does take notice of taxpayers doing the right thing, and IRS agents will often go out of their way to provide valuable help. But you'll need to help the IRS, too. Always keep copies of your pay stubs so you can quickly provide any additional information if a discrepancy occurs. The IRS also takes notice of taxpayers who do not do the right thing, so it's important that you resist the urge to just go with the flow and use the erroneous W-2, particularly if doing so is advantageous to you. Get to the bottom of the situation. It's a safe guess that the IRS will notice the discrepancy sooner or later, particularly if multiple employees are involved, and you don't want to be found as culpable for wrongdoing as your employer.